"The offending flag banned by Strasbourg police". 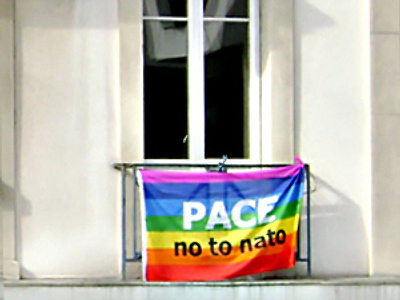 Only days before NATO’s 60th Anniversary summit, Belgian police arrested 414 protestors at alliance headquarters outside Brussels, and French police have attempted to ban anti-NATO flags from windows in Strasbourg. In Brussels, ‘Operation NATO Game Over’ was a rehearsal for the Strasbourg Anti-NATO Summit on April 3-4. In an act of civil disobedience, the demonstrators from ‘Action for Peace’ and other groups called for the military alliance to leave Afghanistan and to remove nuclear weapons from Belgian soil. was also a symbolic burial ceremony for the military alliance outside the wire perimeter fence. Those arrested were held until around nine in the evening and then released. He said the demonstration had raised public awareness about NATO. “You must remember we have regular meetings and demonstrations, and gradually our arguments are getting through to people even though the government tries to avoid any discussion of the subject”. He called for a big demonstration in Strasbourg on April 4th. Pacifists break into NATO headquarters. Anti-NATO organisers generally are reluctant to predict the turn-out for the demonstrations. Helmut Woda, the organiser on the German side of the Rhine, said “it is pointless to predict numbers. We will see when the time comes”. Indications from the internet are that thousands of anti-NATO militants are determined to make their views known. Coaches are being organised for protestors from across Europe particularly Belgium, Greece, and Britain. The annual Easter anti-nuclear march in Kehl is being brought forward by a week for the occasion and a special train will bring activists to the railway station there. Estimates of the likely number of demonstrators vary between 30 and 60,000.
summit.“ He added that ”he knew of other cases where police had demanded the removal of flags from balconies and windows." The affair has aroused a national controversy in France. Asked to comment the office of the Mayor of Strasbourg said it was nothing to do with them and referred all enquiries to the Prefect, the representative of the Minister of the Interior and the head of the national police in Strasbourg. After some delay the mayor issued a statement saying that he thought that “it is not acceptable that certain inhabitants of Strasbourg should be given the order to take down flags that are the symbol of peace”. Calls to the Prefecture were not returned. Police finally explained that they were looking for groups of protestors who might make trouble during the summit.